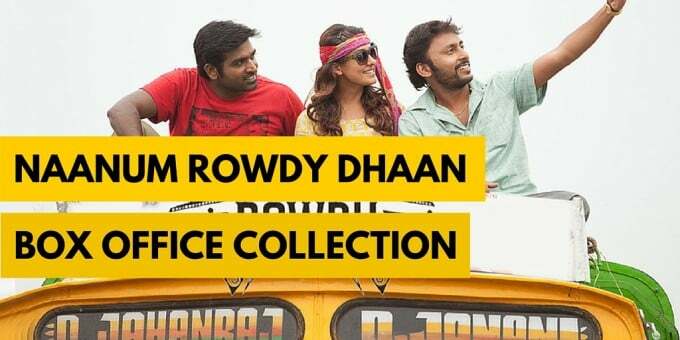 Naanum Rowdy Dhaan, Romantic Comedy Film by Vignesh Shivan starring Vijay Sethupathi and Nayanthara. It is notable that this movie is Vignesh Shivan’s second Movie as a Director. The Movie came up with a lot of Expectatons from Tamil Cinema Audience. This Film made a total gross of 9.6 Crores on the first 5 days which is great given that Vijay Sethupathi is new and doesn’t have a considerable fanbase. This is Vijay Sethupathi’s best Film in terms of Collection till Date. Overseas Collection have been reported as 6.5 Crores, totalling the Collection to 16.1 Crores. Nayanthara killed it on this Movie showing her Cute Expressions and Outstanding Acting. Anirudh’s Music is also remarkable in this Movie. This Movie is running well in theatres with less competitors awaiting the Diwali Major Releases.